One of Israel’s most respected economists, specializing in risk management, futures and options. 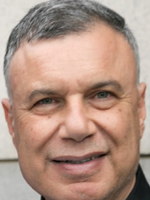 After completing his BA in Economics at Tel Aviv University, Prof. Eldor was awarded a scholarship for doctoral studies at Harvard UniversityOver his academic career, he has served as senior faculty member and lecturer at several universities in Israel and the USA (Boston University, Columbia University, Tel Aviv University and Bar-Ilan University). Prof. Eldor has published over thirty articles in prestigious economic journals around the world as well as three seminal books in economics. Alongside his extensive academic activities, Rafi served as a member and as chairman of the board of directors at number of financial companies, he founded and ran several. He also provides financial and risk management consulting services to large public companies. Over the past 15 years, Prof. Eldor has been volunteering with the Israel Cancer Association and has served as Chairman of its Investment Committee. In this role he is responsible for the management of donations to the Association.